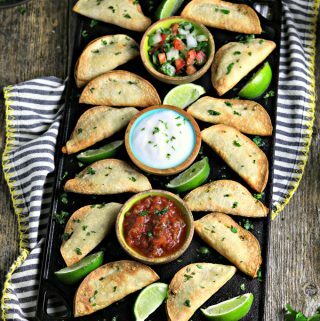 Score big on game day with these crispy Potato Air Fryer Tacos – they’re bite-sized, perfect for dipping, and totally crowd-pleasing! If you’re looking for game day recipe inspiration, you can end your search! 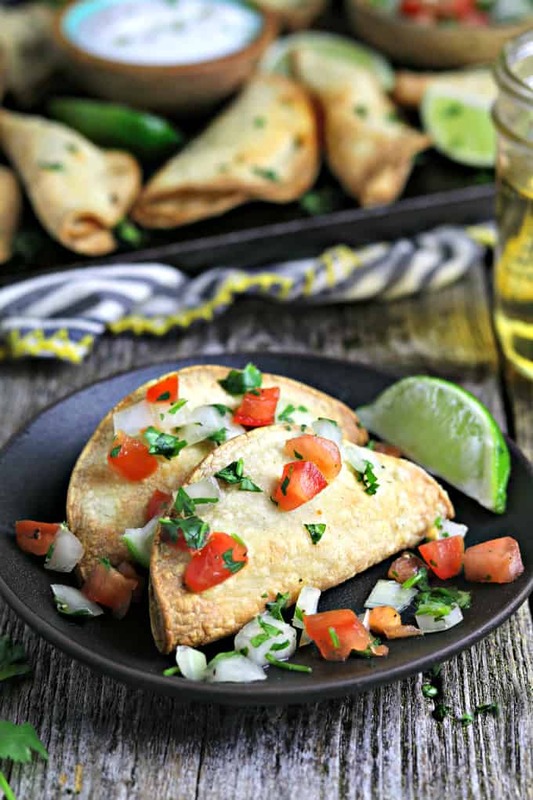 These Vegan Air Fryer Tacos are perfect for a hungry crowd! 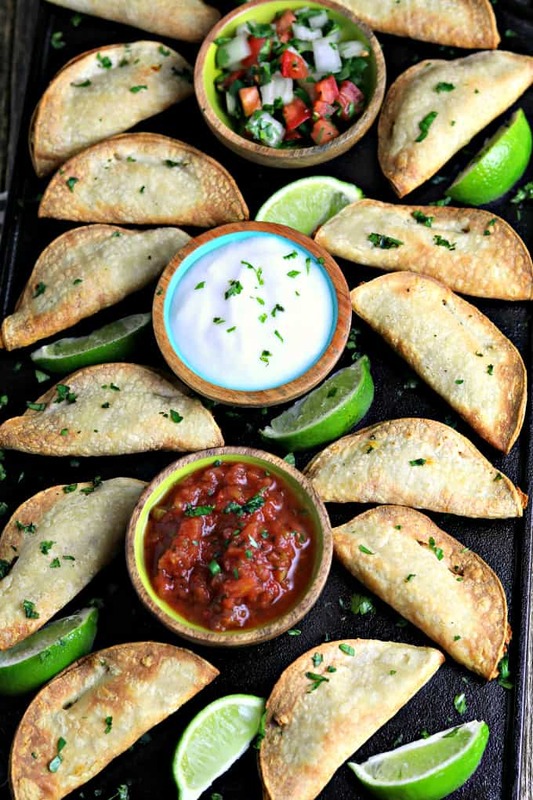 You can serve them along with Salsa, Guacamole, or Vegan Sour Cream and let them just dig in. No forks, spoons or knives necessary! 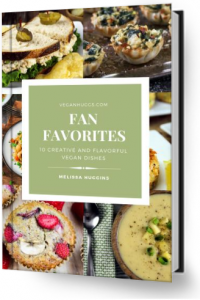 It’s my go-to recipe for party food along with my Vegan Jalapeño Popper Dip and Vegan Crab Bites. They are all easy to make and quick to disappear! Do I need an Air Fryer? I used one for this recipe, but you can absolutely bake them or pan-fry them for similar results. You can find the instructions below. I love using an air fryer because they cook fast and create a nice crisp on food without a ton of oil. Plus, they are easy to use and clean up is a breeze! Which Air Fryer is the best? I haven’t tried them all, but I really love this Philips AirFryer. It works great for my needs and I haven’t had any problems. Also, it’s reasonably priced and fits perfectly with my limited counter space. STEP 1 – Boil the potatoes until fork tender and peel the skins off when cool enough to handle. STEP 2 – Mash the potatoes with seasonings until smooth and well combined. STEP 3 – Heat tortillas in a large skillet until warmed and pliable. Cover in a towel to keep warm. 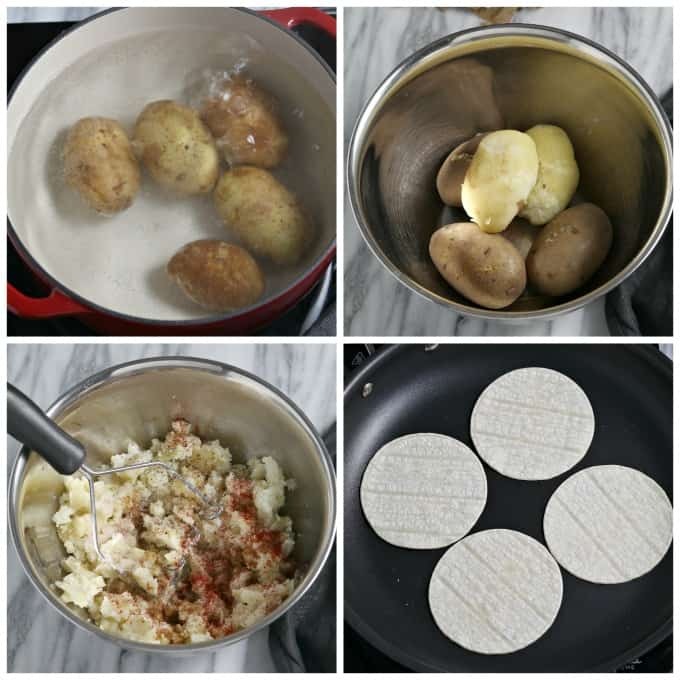 STEP 4 – Spread a tablespoon of potatoes on half of a tortilla. Fold closed and weave a toothpick on top to seal. STEP 5 – Lightly brush each side of the tacos with oil. You can also lightly spray them. STEP 6 – Place tacos in the air fryer basket standing up(stagger them so there’s a little space in between each one). Cook at 390 F for 12-15 minutes until golden and crispy. 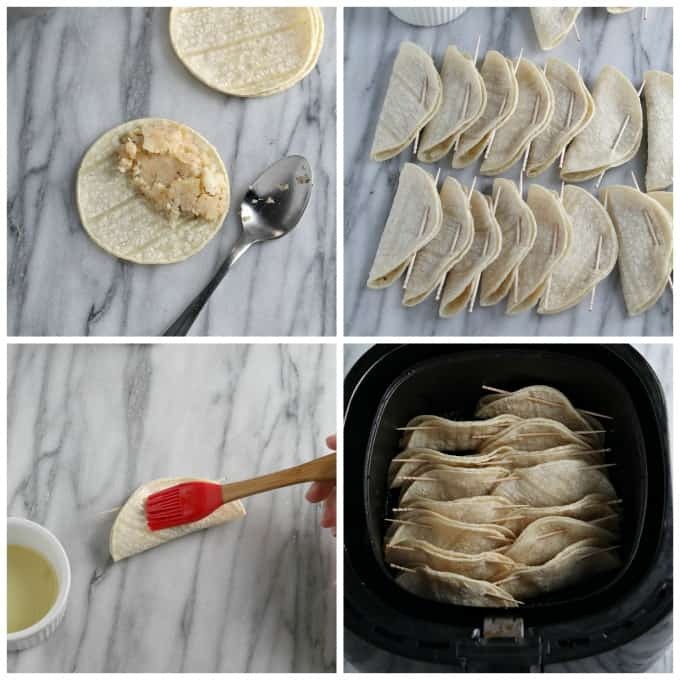 Can I make these Air Fryer Tacos ahead of time? I feel that they taste better when they’re fresh from the fryer. However, you can make the mashed potatoes and prep the dips the night before. If you make these Air Fryer Tacos, let me know what you think by ★ star rating it and leaving a comment below. It would really make my day. You can also follow me on Instagram and share your creation with me. Just tag me @veganhuggs and hashtag #veganhuggs so I don’t miss it. 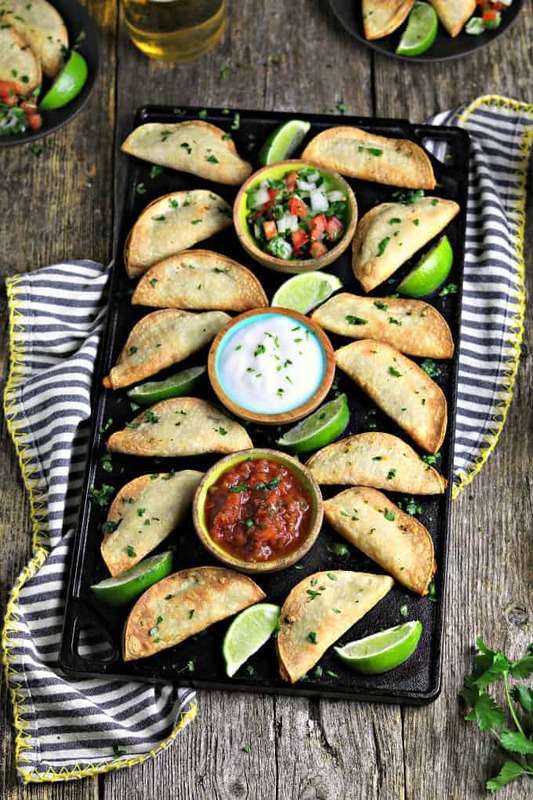 Score big on game day with these crispy Potato Air Fryer Tacos - they're bite-sized, perfect for dipping, and totally crowd-pleasing! Place whole potatoes in a med/large pot and cover with cold water. Bring to a boil over high heat and then reduce to medium-high heat and cook until fork tender. About 15-20 minutes. Drain and slightly cool before peeling. In a large skillet, heat tortillas until warm and pliable. Cover in a towel while you heat the remaining tortillas. Spread about one heaping tablespoon of mash on half of a tortilla. Fold closed and weave a toothpick on top to seal. Brush each side of the tacos lightly with oil. You can also lightly spray them with oil. Place in air fryer basket standing up (stagger them so there's a little space in between each one)Cook at 390 F for 12-15 minutes until crispy (you may need to work in batches depending on the size of your airfryer basket.) See notes for serving ideas. Serving ideas: vegan sour cream, salsa, pico de gallo, guacamole, hot sauce, fresh-cut cilantro, vegan cheese sauce. If you want to amp things up, you can sprinkle vegan cheese shreds inside the taco before frying. Baking Method - Preheat oven to 425 F and bake for 12-15 minutes until golden and crispy. Flip tacos mid-way through (remember to brush or spray tacos with oil). Stovetop Frying Method - Turn your oven on low to keep tacos warm. In a large pan, heat 3-4 tablespoons of oil over medium-high heat. When hot, place as many tacos that will fit in the pan (leaving some room in between to flip). Fry on each side for 2-4 minutes until golden and crispy. Place on a baking sheet and put in the oven while you finish the rest. Perfect for the get together I’m hosting tomorrow! Thanks for the awesome looking vegan taco recipe.